Glauber H, Vollmer WM, Nichols GA. A Simple Model for Predicting Two-Year Risk of Diabetes Development in Individuals with Prediabetes. 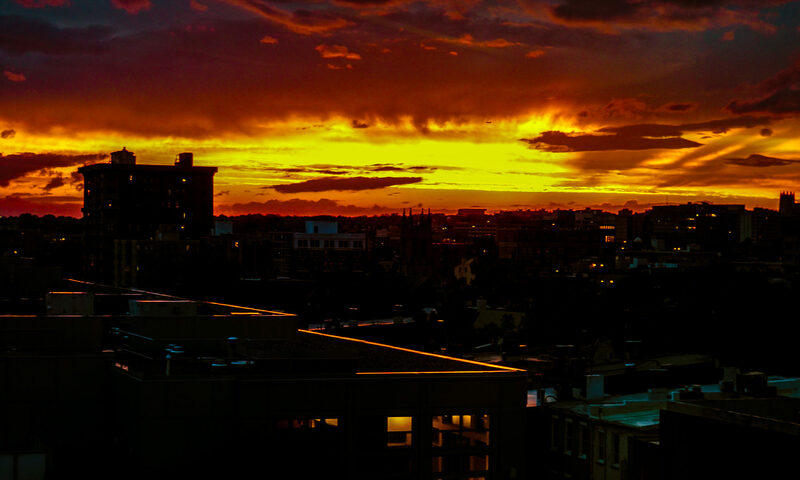 Perm Journal/Perm J Perm J [Internet]. 2018 [cited 2018 Jan 26];2222:17–50. These are two papers, one just published in one of my favorite journals (@PermanenteJ) and one a few years old, published in Diabetes Care. They are interesting to read together because they both leverage Kaiser Permanente data to understand the health of populations. 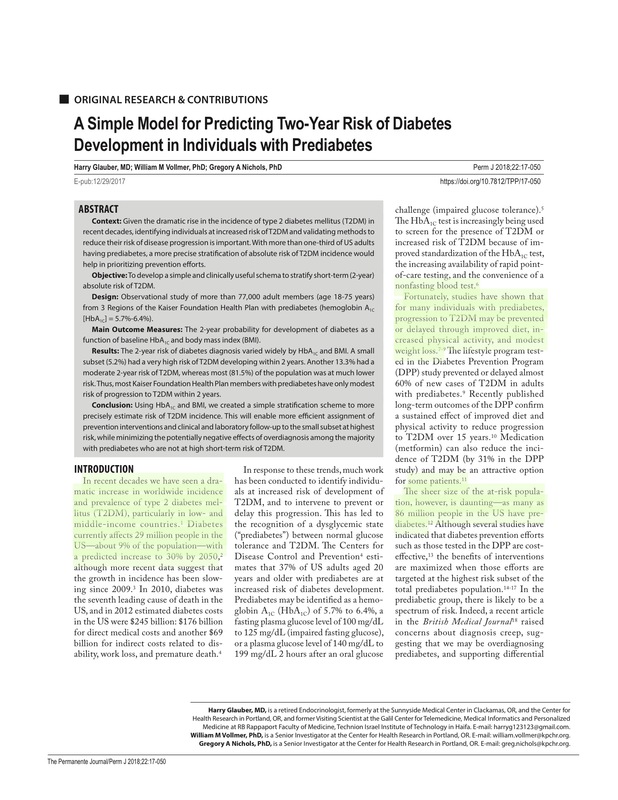 In the Permanente Journal article, the records of 77,107 people receiving care in Kaiser Permanente Georgia, Hawaii, and the Northwest (Oregon) and with pre-diabetes level HbA1c measurements (5.7 – 6.4) were analyzed to see if they developed diabetes two different ways, starting at a fixed point in time for everyone, or starting with each individual person and following them for two years. Currently, KPNW provides medical care to approximately 545,000 primarily white members in northwest Oregon and southwest Washington. e KPHI mem- bership includes approximately 248,000 individuals: About 27% whites, 33% Asians, 12% native Hawaiians or Paci c Islanders, 24% of mixed heritage, about 1% combined American Indian/Alaska Native and Black or African American, and 3% unknown or not reported. Finally, KPGA provides care to approximately 295,000 members in the metropoli- tan Atlanta area. The membership is racially and socioeconomically similar to the surrounding geographic region: approximately 50% white, 45% African American, 4% Hispanic, and 1% other races and ethnicities. The cutpoint appears to be 6 % for association of increased risk for a diabetes diagnosis within 2 years, which is not a lot of time in clinical terms. At the highest risk level, 6.3 – 6.4 %, the risk is in the 20 % range. This is usual care, meaning, state of the art, following currently published evidence-based guidelines. 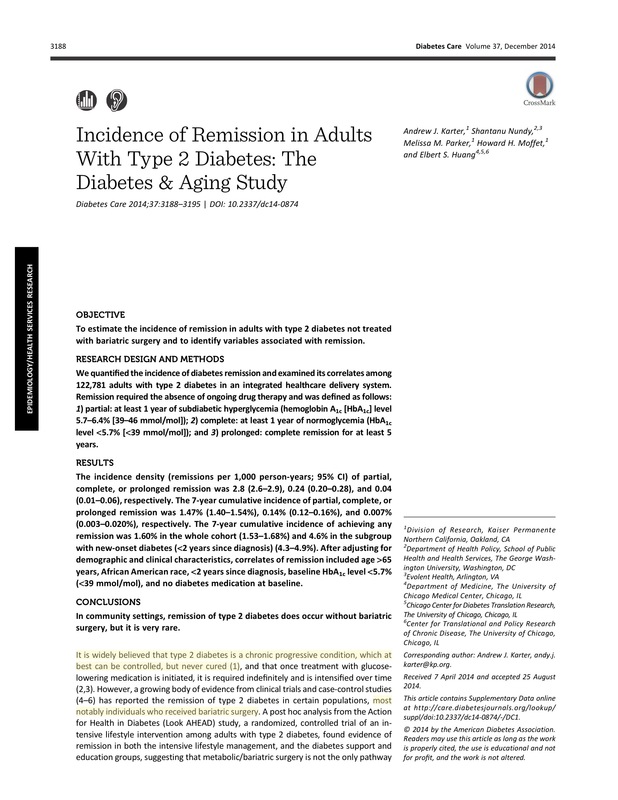 partial remission, which is subdiabetic hyperglycemia of at least 1 year (A1C level not diagnostic of diabetes [5.7–6.4%; 39–46 mmol/mol], fasting glucose level 100–125 mg/dL [5.6–6.9 mmol/L]); complete remission, which is normoglycemia of at least 1 year (A1C level in the normal range [,5.7%;,39 mmol/mol], fasting glucose ,100 mg/dL [5.6 mmol/L]); and prolonged re-mission (or “cure”), complete remission of at least 5 years. Noting: This definition requires the absence of pharmacologic treatment, so no hypoglycemic or other diabetes drugs. Also, for the purposes of the study, the authors used an even more strict definition of remission based on standard lab cutpoints (HbA1c of 5.7 vs 6.0 %). As with the study above, this study used Kaiser Permanente data, but from the Northern California region, from the records of 122,781 people enrolled in the diabetes registry there. 709,000 thousand person years total (!). From this sample, it’s more likely that a person will die than will go into remission. To provide context, 1.7% of the cohort died, while only 0.8% experienced any level of remission, during the calendar year 2006. There’s evidence from this sample that the farther a person is in their journey (on medications including insulin, or with a longer time period of diagnosis), the less likely they will go into remission. This unfortunately feeds the idea that diabetes is a progressive, unrelenting process. Our analysis shows that remission is rare and variable. In praise of the electronic health record, which has been attributed as a cause of physician distress, in this case allowed us the ability to know how well usual care performs in reversing diabetes. Again, this is usual care, meaning, state of the art, following currently published evidence-based guidelines. The authors did not describe the specifics of what that is in this population (and it wasn’t the purpose of the study). This work gives a good baseline of what usual care, delivered in an exemplary, quality-focused environment is capable of. Comments and questions welcome as usual. Dr Nichols receives unrelated research funding from Boehringer Ingelheim GmbH, Ingelheim am Rhein, Germany; Sano SA, Paris, France; Janssen Pharmaceuticals Inc, Titusville, NJ; and Amarin Pharma Inc, Bedminster, NJ. The author(s) have no other con icts of interest to disclose. Previous PostPrevious January 2018, What Am I Doing Now?